After the American victory at Lake Erie, forces crossed the lake into Canada on October 5, 1813 at what became known as the Battle of Thames. British forces commanded by General Proctor were forced to withdraw. The American forces catch up with the surrendering British and Indians and decisively defeat them. Tecumseh, the Indian chief, was killed in the battle. The Creek Indians had continued to be a threat in the South. After the Massacre at FT Mims, a major campaign was planned to eliminate n the wake of Perry's victory on Lake Erie, the path was open for a new American assault on Canada. General William Henry called on Kentucky governor Issaac Shelby to take to the field with the Kentucky Militia. 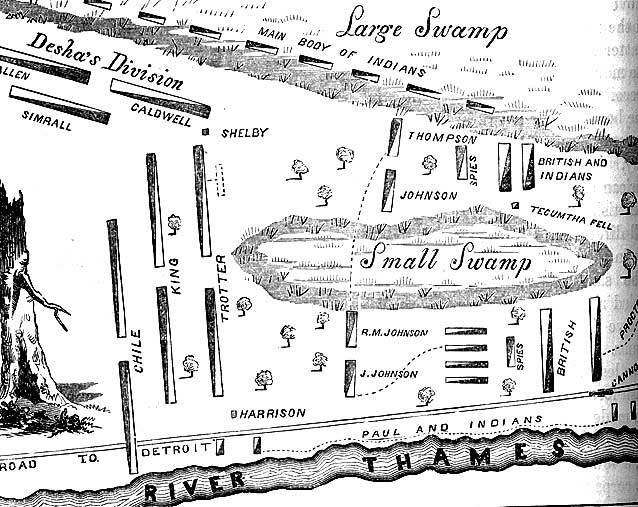 3,000 Kentuckians headed the cal and in late September the Americans set off and recaptured Detroit. The British commander General Proctor knew that that the Americans controlled Lake Erie his position was untenable. Proctor led his British and several Indian troops out of the area in retreat. 50 miles to the east of Detroit, Proctor decided to make a stand. When American scouts reported that the British lines were extremely thin, Harrison decided on a daring strategy: a cavalry assault by the Kentucky troops directly on the British lines. The British were not prepared for this type of assault and when the first wave of horseman quickly rode through the British lines, and then turned on the British from the rear, British troops quickly surrendered. The American forces then went on to defeat the Indians allies, killing most of them including Tecumseh.